I got a chance to sit down with the legendary chef Marco Pierre White. Read the entire interview here, and grab a little nibble below. The legendary chef and television host talks to AOL Food about dealing with unruly diners, his famous protégés and why he’s stopped swearing. AOL: What made you want to become a chef? 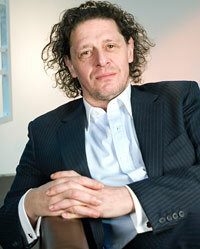 Marco Pierre White: When I was a boy of 16, I left school. My dad put forward the idea of becoming a chef like himself, like my grandfather. He gave me 50p which took me to Harrogate and back on the bus. He told me to knock on the back door of hotels and ask to see the chef. The first hotel I came across was the Hotel St. George on Ripon Road. I played my Sunday best, and I started work at 7:30 in the morning. I’ve got to say, it was the toughest day of my life. This entry was posted in Chefs, Interviews, Writing on March 14, 2009 by Kat Kinsman.